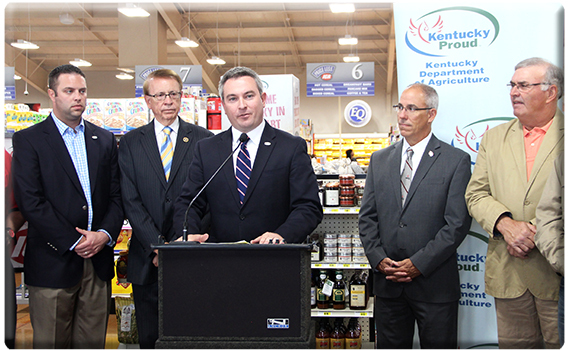 BOWLING GREEN, Ky. — Agriculture Commissioner Ryan Quarles joined officials of Houchens Industries to announce the launch of dozens of Kentucky Proud products in Houchens-owned grocery stores in Kentucky. Kentucky Proud producers who sampled their products at Wednesday’s event included Ranger Bees Honey of Calhoun; Catrina’s Kitchen, Bourbon Barrel Foods and Mr. G’s Kettle Corn of Louisville; and KHI Foods of Burlington. The initial launch will encompass three IGA stores in Owensboro, three Houchens IGA stores in Glasgow, Crossroads IGA in Louisville, and the Price Less store in Bowling Green. Houchens plans to expand the Kentucky Proud initiative to a total of 42 Houchens, IGA, Price Less Foods, and Price Less IGA stores in Kentucky. The items were collected and distributed by Louisville distributor Fishmarket Seafood. Established in 1917, Houchens Industries operates more than 400 retail grocery, limited assortment, convenience, and hybrid grocery and convenience stores in 17 states. With interests in various other businesses, Houchens employs approximately 17,000 people corporate-wide, making it one of the largest employee-owned companies in the United States. Kentucky Proud is the Commonwealth’s official farm marketing program. More than 5,700 farmers, processors, retailers, restaurants, school systems, colleges and universities, farmers’ markets, Kentucky state parks, and Kentucky Farm Bureau roadside markets are members of Kentucky Proud. For more information about Kentucky Proud, go to kyproud.com.